When demonstrating the LINQ tools, I typically start out showing the LINQ to SQL visualizer that’s available with the C# Samples. 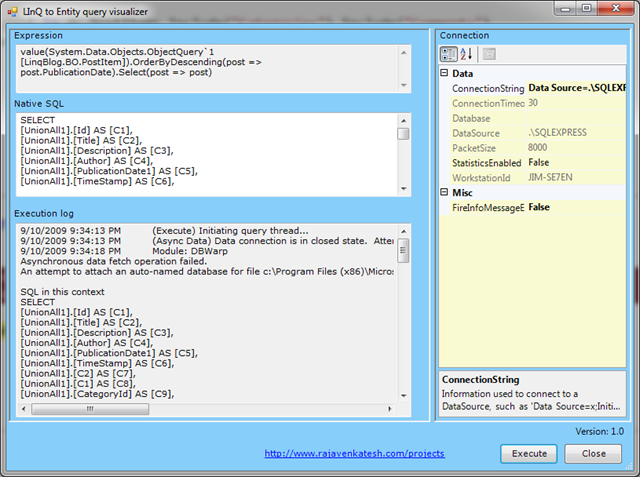 Today I saw that Raja Venkatesh has released a Visualizer for ObjectQuery<T> (aka. LINQ to Entities). As you do with the other visualizers, you enable this by simply saving the AnySourceEntityQueryVisualizer.dll to your Visualizers directory. )Note: :the download page specifies to copy it to your C:\Program Files (x86)\Microsoft Visual Studio 9.0\Common7\Packages\Debugger\Visualizers. However, Windows 7 blocks saving files there by default. Alternatively, you can copy it to your My Documents\Visual Studio 2008\Visualizers. 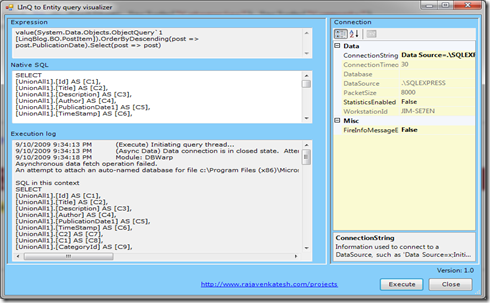 Clicking on the magnifying glass brings you to a screen that shows the Expression, projected SQL, and Connection properties. If you click “Execute”, you will see the server log and a grid with the results. If you want to try it out, feel free to download it from the Visual Studio Gallery page for the LINQ to Entity Visualizer. I’ll be adding a linq to this on my LINQ Tool list as well.